It’s important to reward people for the successes achieved in your organization, but it’s also important to reward the behavior you want from the team. You see, what gets rewarded gets emulated by others who see these things being recognized and rewarded. Want your people to follow-up better? Find a way to recognize a positive action of one of your people in this area and reward them for it. Make an example of it. Need people to ask for help when they run into challenges with one of their project tasks? Show the project team it is an example of strength when someone asks for help early enough so we can do something and avoid putting the project at risk, , , reward someone for asking for help. There are hundreds of things you can do to reward the behavior you want in your organization. The key is you need to stop and think about the behavior you need on the team to mold your people into a highly effective IT support organization. Are any behavior traits coming to mind that you want to reinforce with your team? 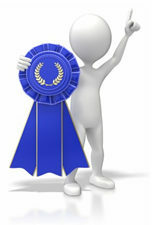 Recognition needs to be for more than just for completing projects successfully. You want to encourage your team to be professional in how they go about their work as well. An organization’s professionalism and client service reputation is built on not only what you accomplish but also how you go about it, , , i.e. the behavior of your team. An IT organization’s reputation is solid only if the manager chooses to pay attention to it. If not, your reputation will evolve based upon what’s going on and how your people handle the support business. Take charge of the situation by encouraging best practice behavior, , , you do this by recognizing and rewarding the desired behavior you want. It’s difficult to force people to do things, but they will follow examples of positive behavior when they see it recognized and rewarded by their manager. My brother told me about a product called Evernote a year ago, maybe longer. I took a quick look at it but didn’t do anything, , , looked like a simple list or note app to me and not much more. I was wrong, , , again. I’m finding that the more I use Evernote the more I tend to save things, , , items I wouldn’t have even thought about saving before. A great use that helps me is that when I see something in email or browsing the Internet that I think I want to remember, , , a quick snapshot goes into one of my Evernote notebooks. It’s great for collecting article ideas that I might want to write about in the future. I used to do this with a hardbound notebook and it was great but it adds weight to the briefcase and no one needs that. It’s also great for simply making notes to myself, , , you know, those great ideas that pop into your head that you want to remember, , , but the next day you can’t!! Probably never happens to you but it does with me all the time, , , or it used to but not anymore. I’ve also started putting my To Do List on Evernote – in fact, I have a Notebook called To Do List. This allows me to list all the things I need to do at some point (my master list) but also highlight what needs to be done this week (my priority list). The other neat thing is that when I complete a To Do item I can check it as completed or scratch through the item so it’s easy to see, , , even copy it to a Completed List to keep track of what I’ve accomplished if I want to. Training is a tremendous motivator for IT employees so identifying a training program for each of your employees is very important. The same thing is true for other employees in your company. Something you should consider is creating a training studio for your company to develop and package training classes that can be used over and over. It’s a lot simpler and cheaper than you probably think. It can even save your company thousands of dollars in training expenses. There are many variations to “packaging” a training class, , , anything from creating an audio file that can be listened to repeatedly, , , developing a PowerPoint presentation that you do a voice-over and record, , , to video recording a live presentation. Each of these variations are easily accomplished and inexpensive to produce with today’s technology. The easiest to do with both audio and video is the 2nd option, , , creating PowerPoint slides and recording a presentation, so let’s focus on this approach. Let me clarify something. In this approach, you will record an audio voice-over and screens of a PowerPoint presentation as you deliver it in a controlled studio setting, not in front of a class or group of people, , , although you certainly could record in a live class. First, Camtasia Studio is one of the best and easiest recording products available and it’s inexpensive at $299.00 as of this post. I use it and highly recommend it. Camtasia records your PC screen and audio as you work through a presentation, , , browse the Internet and make comments, , , whatever you do is recorded while it is turned on, , , can even access your PC webcam to record you if you wish. Second, good audio is a requirement so you want a good microphone. The good news here is that audio quality has improved significantly and a quality microphone is inexpensive. I have a professional grade Audio-Technica microphone on my desk that I use, but you don’t need to spend what I had to spend 7 years ago. I recently purchased a small portable mic to take with me on the road and it does a great job, , , almost as good as the pro mic in my office. 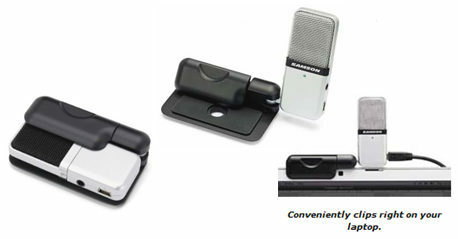 The mic I bought is a Samson Go Mic Compact USB Microphone – Plug n’ Play from Amazon.com; sells for $39.99 at time of this post, , , plus it’s usb and works with no additional software, , , it’s been a great tool for me. Did I say portable? The case is 2 x 3 inches, , , slips in a small pocket of my briefcase. Develop a PowerPoint presentation for your training class. Prepare bullet talking points for each slide in your presentation – it will help you focus and cover all the key points when you record your presentation. How to edit out the sections where you make mistakes in the recording. In any recording session there will be mistakes, , , deleting these minor hiccups is easy with Camtasia. Set up a quiet room to do your recordings. The microphone is quite sensitive and will pick up outside noise so you want to do your recordings in a quiet space. Set up your PC to record – turn on the audio and Camtasia recording. Do a quick test of just a slide to insure all is working as you expect. Publish your session to the desired format you want to use. Another nice thing about Camtasia is that you can publish your recordings to mp4, YouTube, and other formats that makes your recordings accessible by virtually any PC, laptop, or mobile device technology. You can set up a recording studio in your company quickly and easily and at a very low cost to begin developing training programs that can be used again and again, , , not only for your IT organization but for your entire company. Total cost if you already have a laptop and PowerPoint (and most of us do) – $338.00. Not bad when you consider doing this can save your company thousands of dollars by reusing packaged training programs, making them available over the internet, etc. So, , , you want to be an IT manager, huh? Let’s assume you are beyond the “why” part, , , let’s focus on the preparation part. To be promoted into an IT manager position can be a difficult proposition. You see, senior managers want people who can actually manage others and lead them to success. They want leaders who can motivate other employees and can make things happen. They want people who are organized and who take appropriate initiatives. And lastly, there aren’t a lot of new IT manager positions to open up in most companies. Senior managers know that the IT manager role is a difficult position to be successful in. In my opinion, IT manager is the most difficult management position in your company. Few companies offer programs that will develop and groom a technical employee for an IT manager position. Only the bigger companies tend to have formal training programs, and even they do not really offer a program that focuses on developing an IT manager. At best, they will offer general management topics. Sound difficult? It should, , , unfortunately, more people fail at IT management than succeed, , , it is a challenging job and far too often there is no one around who can help a young IT manager “learn the ropes”. Enough already, , , what are the things you can do to prepare for an IT manager role so that when an opportunity comes up you have a good chance in being selected for the position? Here is what I recommend. You do what you say you will do. You complete your assignments successfully. This is extremely important because the results you achieve and how you go about your work tells senior management whether you are reliable and they can count on you to do a good job. You need an excellent track record if you want to become an IT manager. I also think it’s important that you exhibit to senior managers that you are concerned about the quality of work and that you are willing to “go the extra mile” to insure you take care of your client and that you do a thorough job. 2. Gain project management experience – Managing projects is some of the best preparation you can do to prepare you for an IT manager role. You deal with people, you have to manage client expectations, deal with target deadlines, , , plus you have to plan, budget, organize and hold meetings, communicate with different groups of people, etc., , , many of the things an IT manager has to do. Every project you manage needs to be delivered on time, within budget and meet the client’s expectations for the project. Be sure you invest in your projec t management knowledge and find tools that will help you succeed in this area, especially if your company does not have a development program. If interested, I offer a book and tools that can help you learn how to manage projects effectively titled, IT Project Management, a practical approach. Something you will want to do is to track your project success rate. There is a big problem in IT about failing to deliver projects successfully. Your ability to show that you have a strong success rate in delivering projects can make a huge difference. 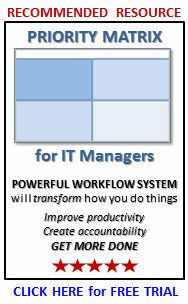 A simple tool called an IT Initiatives Portfolio can help you show how well you do in this area. Check out the article and free download in ITLever. 4. Learn about the business – You need to learn about what the business does and what makes it successful, , , both profitable and productive. Who are your company’s ultimate clients and what role does technology play in each department’s ability to support your company? Start with a high level view of what the company is all about and learn about the strategy your senior management team has in place to grow the company and make it more successful. Then, work your way down to the departments in the company and begin learning “what makes them tick” by learning about their objectives, challenges, and how they depend upon technology to do their jobs. Now, you don’t need to become an expert in the business side but having a good perspective about what your customer has to do to be successful and their dependencies, issues, and challenges they have with technology is very good insight to have. 5. Develop your communication skills – One of the biggest hurdles a new IT manager has to overcome is being able to communicate effectively. Most of us in IT have poor communication skills and even have a low desire to communicate outside our “inner circle”. To become an effective IT manager, you have to communicate well with all different types and levels of people. 6. Show everyone you are a team player – How you go about your work means a lot, , , probably much more than you might think. Learning to work with others in a collaborative way so you reach a “win – win” result is key. It doesn’t matter if you are talking about working with other employees or if it is clients or outside vendors. Senior managers want their young managers to be positive and work constructively through challenging issues, , , and teamwork is a key trait they look for. 7. Exhibit traits of working well under pressure – IT managers deal with tough issues from time to time. Be aware that how you handle pressure situations will be something senior managers will evaluate you on before they give you an IT management position. Show them you are calm yet have a high sense of urgency and that you think through issues and possible outcomes before “pulling the trigger” on problem situations. 8. Show managers that you understand business value – Effective IT organizations deliver tangible and quantifiable business value, , , they don’t deliver technology. 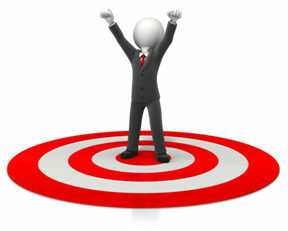 Every recommendation for investment of time and money from the company needs to be targeted to deliver business value. Start as early as you can in your career to look at the business reasoning for spending money and using people’s time to do things. If there is no business value that will result from a project, you need to question whether you should be doing the project. When making IT recommendations think like a business owner. If it were your money, would you want to spend money on this recommendation? 9. 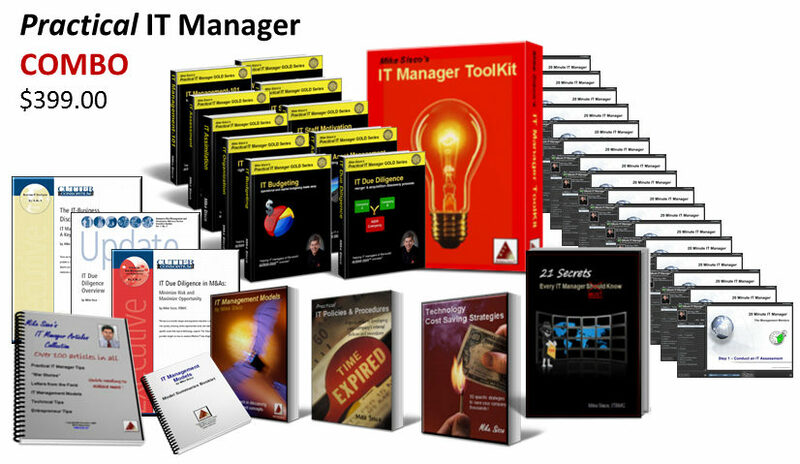 Make your manager aware – Your manager needs to be aware you aspire to become an IT manager. He or she must agree that you would be a good candidate for such a position so again, , , your track record and how you go about your day to day work speaks volumes in terms of whether they see you as a viable management candidate. Sit down with your manager to discuss your goals and the possibility of preparing yourself for a future management position. Develop a game plan with your manager on specific education you should obtain as well as experiences you should gain in your preparation efforts. Once your manager knows management is your goal and agrees you have good potential for it based upon what he has seen, , , he can position you for project management work, make investments in your training that will help prepare you for a management role, and begin positioning other senor managers for your future promotion. 10. Find a mentor – Learning from someone who has already, “been there, done it, and has the t-shirt” as they say can help you in so many ways. Try to find a senior manager in your company or even outside it who will be willing to help provide guidance in developing your skills that are necessary for your future IT manager responsibility. You can learn a great deal from a mentor plus they can be great resources to run questions by, ask for their advice, or just have long casual discussions about things that happen in a management role. 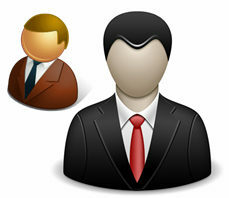 Your management mentor does not have to be an IT manager although it would certainly be beneficial. What’s important is that you learn about basic management principles so you are preparing yourself and gaining insight from experienced managers. The other nice thing about developing a strong relationship with a mentor is that once you become an IT manager you will have someone to call when you deal with new issues for the first time. I’ve had 30 years of IT management experience and I still have a couple of people I consider to be my mentor, , , you’re never too old to learn and another manager’s insight can be very valuable. 11. Volunteer – Candidates who have shown they are willing to “do more” and who consistently look for ways to help the team have an edge over other candidates who do just enough to get the job done. Look for opportunities to help your manager and other managers in the company, , , even to help fellow employees and your clients. This “willingness” to help others goes a long way. 12. Create a professional image – IT employees need positive role models so take a good look in the mirror every morning before you go to work. Are your clothes nicely pressed and professional looking, are your shoes shined, is your haircut nice and neat? You may not think it’s a big deal, especially if your company operates in a business casual environment, , , but I can assure you that when senior management looks for a new manager, they want a strong positive role model, , , someone who represents your company well. Your casual attire may not affect you all that much as a technology expert, but when your role impacts other employees and is one where you need to be a positive role model, I can assure you it’s something that will matter. If you are serious about wanting to be a manager, take a look at how senior managers of your company dress and how they look when they come to work. Find a role model and start doing your part to create a good example for others to follow. Getting prepared to manage does not guarantee you will be promoted into a management position. More on this in just a minute. However, if you are not prepared, the odds of receiving a management position are extremely low, , , so if you think you want to become an IT manager, the smart thing is to start preparing. And, what I can tell you is that when a manager invests in someone to take on more responsibility, he or she usually wants to help the employee obtain the opportunity. There has to be a management position open. You have to be qualified for that specific position. Senior management needs to think you can do the job and you are the best fit. There probably needs to be a replacement strategy for the vacancy you will create when promoted. In addition, if you are in a small company where there is only one IT manager, you may have to be prepared to leave your company to be promoted because the one manager who is there isn’t going anywhere. My advice in this area is that you should be patient, , , especially if you work for a strong IT manager, , , you might be able to learn a great deal from him or her that can help you considerably down the road. Additional responsibility goes to those who are prepared and who have shown they can “do what they say they will do”. When senior managers look at management positions, they also look for candidates who have shown they can work well with people, are positive role models and who can make a difference. Position yourself and develop your knowledge and experience in a few key areas and you may find yourself managing an IT organization one day. Want a quick checklist? 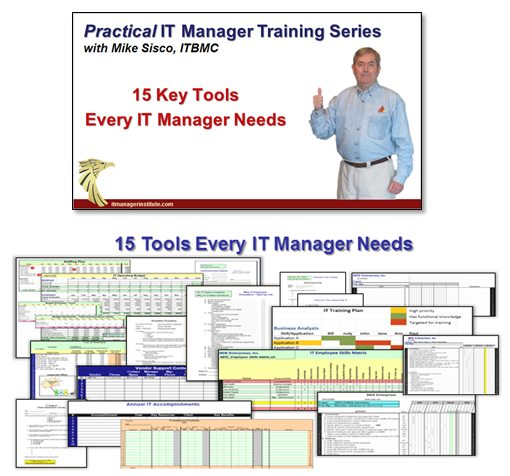 12 To Do to Prepare for an IT Manager Position – Summary List. 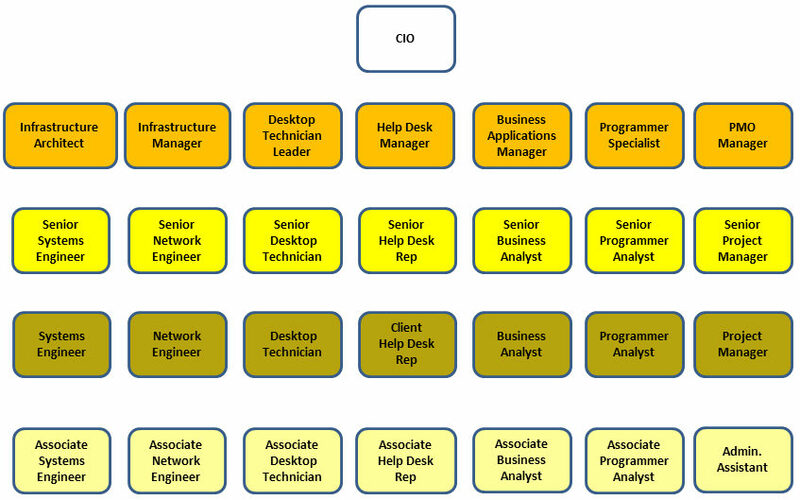 Recently, I took on a consulting project to temporarily manage an IT organization of 35 employees or so. One of the key initiatives of this interim IT Director role was to put in place a Career Development Program for the team. If you need to do this in your organization, you might consider the steps I took . 1. Define your existing organization structure – First, you need to quantify your existing IT organization structure so you have a sense of the current positions. This is a standard Organization Chart that probably looks something like the chart below. Instead of positions filled as shown in the example you would list employee names under the manager they report to. 2. Define the Career Structure you want to manage to – This is not an Organization Chart, , , instead, it is a structure that defines the career positions that your staff will fall into. For example, there might be four levels of programmer positions, , , Associate Programmer, Programmer, Senior Programmer, and Programmer Consultant. The chart below is similar to what we developed in the consulting project. As you can see there are several skill disciplines (when viewed by columns), , , for programming, business analysts, desktop technicians, etc. This is not an Organization Chart, , , it is simply a Career Path Structure that shows the career progressions for each skill discipline. If you have 10 programmers, seven of them might be at the Programmer Analyst position, two in the Senior Programmer position and one in the Associate Programmer position. In addition, each position will have a range of salary levels that are appropriate for the level of skill and knowledge of the position. 3. Revise and/or develop new job descriptions for all Career Structure positions – This is the hardest part and requires considerable time, , , but when completed you will have an updated set of job descriptions that match the Career Structure you plan to put in place. You will need your Human Resources Department involved in this one so your finished product complies to standards HR has for the rest of the company. 4. Conduct a staff skills inventory assessment – One of the things you will want to do when you roll out your Career Planning Program is to show your employees a commitment to investing in their growth. Most organizations have “silos of knowledge” where all the knowledge and experience in a topic is contained in one or two people. This creates risk for your support organization so you need to determine where these gaps exist in order to develop additional depth, , , especially in mission critical support skills that are needed in your company. To do this, list all the technical skills and application knowledge you need in your organization, , , then quantify who has these capabilities in your organization. There are many ways to do this, , , in this project I used a simple spreadsheet like the one below that made it easy for me to see where the knowledge gaps were. In this example, I show you a section for the Business Analysts, , , you should have a similar skills inventory for each of your skill disciplines. We list all the technical skills in the first column to the left, , , in this case each of the Business Applications we support as an IT Organization. If an employee functional knowledge of an application, shade the appropriate cell beneath the employee’s name in green. This clearly shows you where you have minimal functional knowledge. In these cases, you need to target training for these areas. The red shaded cells represent the people we want to target training for each application. Once you see where you need to focus training, you should prioritize your training efforts by highlighting the applications you want to prioritize. This is a subjective exercise based upon which applications you deem to be mission critical or more important and the applications that have the greatest risk due to lack of functional knowledge. In looking at the sample, you can see Application A is in good shape with three people with functional knowledge. On the other hand, Applications B, C, and D only have one resource with functional knowledge for each, , , you need to do some training in these applications. Application E has two people with functional knowledge. Ideally you would like to have at least three people capable in major applications so there is ample backup. That’s why we decided to train Bill on this application. 5. Identify the most important training focus areas – Once you can see where your gaps are (where you have minimal expertise), you can identify which of these areas need to be prioritized for training. Focus on skill areas you’ve identified as mission critical and skill areas that have minimal expertise, , , applications shaded with orange in the sample above. 6. Develop an IT Staff Training Plan – Every employee should have a specific training plan for the year. You want their training to be focused and that will help reduce the knowledge silos you have in your support organization. The Skills Inventory shown in EXHIBIT C does this for you. All of what we needed to do in training for this organization could not be completed in a few months, , , maybe not even within a year. However, with a focus that’s prioritized based upon filling mission critical skill gaps we thought we would be able to make huge leaps in developing additional depth of knowledge throughout the team. Also, by spreading around the responsibility to deliver training you will be able to go faster. 7. Deliver the Career Planning Program – I’ll write a BLOG post later on this topic and go into it in some detail, , , there are many things to consider when beginning to career council your employees, , , plus there are additional tools you will need to deliver your Career Plan message. Be aware that when you deliver a Career Planning Program to employees who have not seen a program like this it is going to create some anxiety among the staff. When everyone finally sees where they fit within the Career Structure, there will be people who think they should be higher on the chart. Even if they are OK with where they are, they can be concerned about where someone else is placed on the chart. Trust me, there will be issues so get prepared to handle them before you deliver the program. When you deliver the Career Structure to the team, be sure you cover the program in detail including your training focus and have plenty of time for questions and answers, , , there will be many. Understand, you will not be able to make everyone happy with a Career Planning Program initially. What’s important will be to put a structure in place that provides a career path for your staff and a training program that invests in their development. Over time, the noise level will diminish and you and your staff can use the program to provide a guide to help further people’s career, , , which is what it’s intended to do in the first place. To get there requires some work, an understanding of your team, possibly even some rough waters in the beginning of the implementation, , , but the benefits can be big in the long run. One last comment, , , if you have a small organization of 12 or fewer people, it is difficult to have much of a Career Planning Program. For example, in a small IT organization there may be just one manager. The only way someone gets an opportunity to manage in the IT organization is if the current manager leaves for some reason or if the company grows enough to justify a larger IT organization with more IT managers. IT employees want to succeed and they need a path for growth, , , it’s up to the manager to make it happen.